Journal World of Medicine and Biology seeks to provide platform for close scientific collaboration of researchers engaged in basic medical problems, i.e. morphologists, physiologists, biologists and representatives of clinical specialties whose research show the ways to address both fundamental and applied problems. Over the past two decades science has made a huge step forward. Today it is difficult to imagine experimental or clinical research, which has not applied up-to-date biochemical, immunological, morphological methods. Structure and function of organs, development of pharmacological preparations and many other things are studied not only on micro- but also on nanolevel. 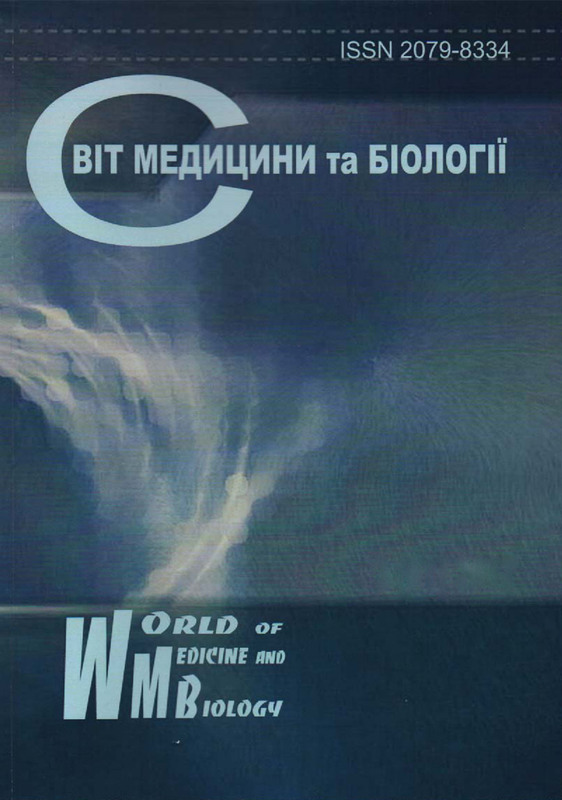 Fortunately, there is plenty of specialized medical and biological journals in Ukraine. However it is noteworthy that research findings published in them create certain fragmentation of information, often resulting in undeserved lack of demand due to the fact that interesting and useful developments become known to a narrow circle of professionals, and the published data are not disseminated as extensively as desired (not all journals can be accessed electronically) first of all and secondly, there is inadequate overall co-ordination of results of research of the same problem studied from different perspectives. Hence, the World of Medicine and Biology serves a link between scientists engaged in different areas of research in medicine and biology, between experimenters and clinicians. The content of the journal allows to stay informed about the majority of relevant developments, discuss them, get necessary information about research areas and scientific schools, dissertation research, conferences and congresses on topical issues of medicine and biology. On the pages of our journal the separate pieces of studies fit together to reflect the current status of medicine and biology. The goal of this journal is to provide opportunity for authors to publish their research findings of doubtless originality and novelty. The Editorial board includes renowned scholars. The articles are peer reviewed by the independent experts of the relevant specialties. In our work we refer to the principles of the Budapest Open Access Initiative. In addition, the editorial board is guided by rules and principles of the following international organizations: Committee on Publication Ethics, World Association of Medical Editors, the International Committee of Medical Journal Editors and Creative Commons (CC BY-NC-SA 4.0). Scientific Electronic Library "Cyberleninka" (Russia). We hope that the World of Medicine and Biology will contribute to the development of medicine and biology, and serve a guiding star to many young scientists and provide a platform for discussion of theoretical and applied problems of modern rapidly developing science.